Gold futures moved up for the sixth time in seven sessions on Monday, and closed to a more than three-month high. Gold for December delivery settled up $8.60, or 0.7%, to $1,164.50 an ounce on the Comex division of the New York Mercantile Exchange. The close was the highest since July 6 when prices climbed to $1,173.20 an ounce. Gold, opined analysts, continues to enjoy support from lowered expectations of a Fed rate hike this year. "The idea in the market that the Fed will lift interest rates this year is out of the market," Reuters quoted LBBW analyst Thorsten Proettel. "People aren’t expecting an interest rate hike this year, with the bad jobs data from the United States, and the problems in China." The yellow metal traded from a low of $1,154.30 to a high of $1,168.60. Trading volume was lighter than typical with Columbus Day. Banks and the U.S. government closed Monday for the holiday. Gold prices last week advanced by 1.7% for their third weekly gain in four weeks. Elsewhere, silver for December delivery gained a nickel, or 0.3%, to close at $15.86 an ounce. Silver prices ranged from $15.77 to $16.08, after surging 3.6% last week. Last Wednesday, the precious metal jumped to $16.09 an ounce for a 15-week high. January platinum added $14.50, or 1.5%, to $995.90 an ounce, trading between $978.40 and $1,003.40. Palladium for December delivery fell $13.50, or 1.9%, to $694.65 an ounce, ranging from $692 to $717.70. Last week, platinum rallied 7.9% and palladium gained 1.5%. Gold rose $13.35, or 1.2%, to $1,164.90 an ounce. Silver dipped 3 cents, or 0.2%, to $15.96 an ounce. 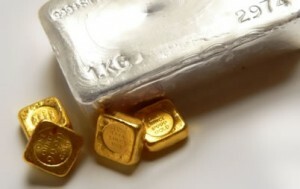 Last week, the metals logged increases of 1% for gold, 10.8% for silver, 7.2% for platinum and 4.2% for palladium.